Currie by Brenton now offers robotic palletizing solutions, continuing its over 100-year tradition of providing customers with durable, high performance solutions. Currie by Brenton now offers robotic palletizing solutions, continuing its over 100-year tradition of providing customers with durable, high performance solutions. New robotic capabilities expand Currie by Brenton’s product offering to a full range of standard and custom conventional, robotic, gantry and bulk palletizing solutions. By offering both conventional and robotic palletizing products, the Currie line of palletizers meet virtually every automated palletizing challenge and bring customers an expanded selection of capabilities, flexibility, throughput, and investment value. Currie’s full line of standard and custom automatic solutions meet packaging needs ranging from a low cost entry level machine to machines that can palletize at rates in excess of a 100 cases per minute. Currie offers the additional benefit of integrating any palletizer with a stretch wrapper and/or corner board placer for a complete end-of-line solution. Customers have the ability to select existing pack patterns or program new pack patterns on the HMI, eliminating the need to use a computer. Safety features include framed guard door package, CAT II safety circuits and muting light curtain that meet requirements for the most stringent safety programs. 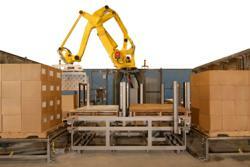 Robotic and conventional palletizers reduce repetitive stress injuries and provide long-term durability, performance and investment value for the most demanding packaging operations. See Currie by Brenton robotic palletizers at Pack Expo International in booth N-4013 (Currie by Brenton) and S-760 (Edson Packaging). For more information please contact Currie by Brenton at (800) 535-2730 or currie(at)becmail(dot)com. Currie by Brenton offers palletizers that come with a proven track record with over 1,700 conventional and robotic installations. The Currie by Brenton full line of palletizing solutions uses uncompromising designs which help maximize the reliability and value of your machinery. By offering both conventional and robotic palletizing products, the Currie line of palletizers meet virtually every automated palletizing challenge and bring customers an expanded selection of capabilities, flexibility, throughput, and investment. For more information about Currie by Brenton visit their website at http://www.CurriebyBrenton.com or contact them at (800) 535-2730 or currie(at)becmail(dot)com.